From rooftop supper clubs to late-night markets, the summer months in London welcome a host of new events that are simply not possible during the rest of the year. Here LondonTown.com outlines the best summer pop-ups and events taking place around town. Skylight returns with urban lawn games, summer cocktails and major sporting events on the big screen. From 2nd May 2019, Skylight returns with urban lawn games, summer cocktails and major sporting events on the big screen on top of Tobacco Dock. The summer season also boasts a Hendricks Summer Solstice party, Opera at Skylight and a Dog Day. Set on the top three levels of a former car park in Wapping, the 600 capacity Skylight has multiple bars, indoor and outdoor seating areas, private gardens booths, and two street food stalls, all set against some of the finest views in the city - you can see The Shard , The Gherkin and the Walkie Talkie from here. Grab a seat on the upper level - featuring brand new day beds for 2019 - for prime views and extended sun rays before enjoying a spectacular show of yellows, oranges and pinks when the sun sets in the shadow of London's most famous buildings. Food wise, visitors can choose between burgers and souvlaki with Flip Side and Yiro taking over the kitchens and a new refreshing seasonal cocktail menu has been added alongside spritzes, pitchers, bubbly and wine. Book in for a game of croquet on the upper deck or, if the British weather isn't on your side, there are two playing areas inside. Five months of comedy, cabaret and children's shows. A festival-inspired pop-up with prosecco popsicles, street food and live music. The rooftop is transformed into a Mexican town with tacos and tequila galore. Tacos, tequila and giant frozen margaritas are the order of the day at the Queen of Hoxton Rooftop, which takes the theme Las Mexicanas for its summer residency. The space has been transformed once again, morphing into the secret den of the Luchadores (lady wrestlers). Taking inspiration from the colourful backstreets of San Cristobal in Mexico, the rooftop is now home to a band-stand, a wrestling ring and a backstreet bar, where guests can order a Chilli and Mango Margarita, a Watermelon Paloma or a Mezcal Cantarito to help wash down slow cooked pork and pineapple tacos, fresh nachos and chilli cheese burgers. 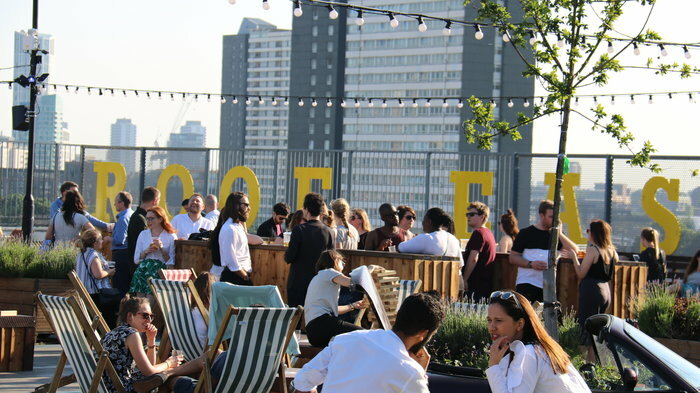 Throughout the summer, the rooftop will also play host to a number of themed events including feminist embroidery, mezcal insect tasting and Trump pinata making. One of London's largest rooftop gardens has been transformed into boho-chic festival-inspired space. This two-day event brings the best of the British seaside to London. Bringing the seaside to London, The May Fair will take over Grosvenor Square for two days on the May bank holiday weekend. Providing the chance to enjoy the best bits of the great British seaside right in the heart of historic Mayfair, it will boast everything from helter skelter and fish and chips to coconut shys and candy floss. There will be maypole dancing, children's crafts, a traditional fun fair, educational workshops and a whole host of live music and entertainment. From cheap budget accommodation to luxury 5 star hotels see our deals for hotels, including The Nadler Hotel Kensington from 39% off.